It may appear that the battle royale genre is getting quite crowded recently. But the intense saturation of titles is forcing game developers to really think about how they can make their game stand apart from the powerhouses of the genre, including Fortnite and PUBG. Hi-Rez Studios’ is doing its best to stand apart from those developers with its latest addition to the battle royale genre, Realm Royale. The game features unique, class-based gameplay that many compare to massively-multiplayer online titles, due to its fantasy theme, class-specific abilities and equippable armor and weapons. We think the game is more comparable to team-based shooters, such as Overwatch or Hi-Rez’s own Paladins, from which Realm Royale spawned. Classes in Realm Royale start with a movement ability and can equip two additional abilities from a small pool of possible choices for their class (each class has only five skill choices at this time), so it’s really not much like an MMO, which generally offers way more skill choices. Both games feature 100-vs.-100 player matches taking place on a giant map. Both start with your character falling from a flying vehicle: a zeppelin in Realm Royale, and Party Bus in Fortnite. Both feature a threatening force of nature that slowly reduces the active play area (the “Fog” in Realm Royale, and the “Storm” in Fortnite). Both feature the “last one standing” victory condition. In this guide, we offer a side-by-side comparison for players new to the genre and looking for the game that will best suit them, and for veteran battle royale players interested in what Hi-Rez’s new addition to the genre has to offer. It’s extremely important to remember that Realm Royale is still in alpha, and Hi-Rez is constantly making changes to the game, including adding new weapons and balancing existing weapons and abilities. There’s even an Alpha Test Server which anyone can join to try out the latest patches before they hit the live (but still Alpha) server. Hi-Rez has been using this test server to test huge adjustments to the game’s balance, and appear to be open-minded to trying almost anything to see how it could work out in Realm Royale. Here’s how some of Realm Royale’s gameplay and features compare to those in Fortnite. Realm Royale offers three different queue choices: Solo, Duo or Squad. Players who choose to join the Squad queue will be automatically placed with a team of three other players. Eliminations are shared with your squadmates, so playing with a squad offers players the opportunity to more easily rack up kills and earn wins, which will increase their player ranking. Fortnite features the same options; you can queue as Solo, Duo or Squad. It’s worth noting that eliminations are not shared in Fortnite, so you will have to land the final blow on a downed enemy. 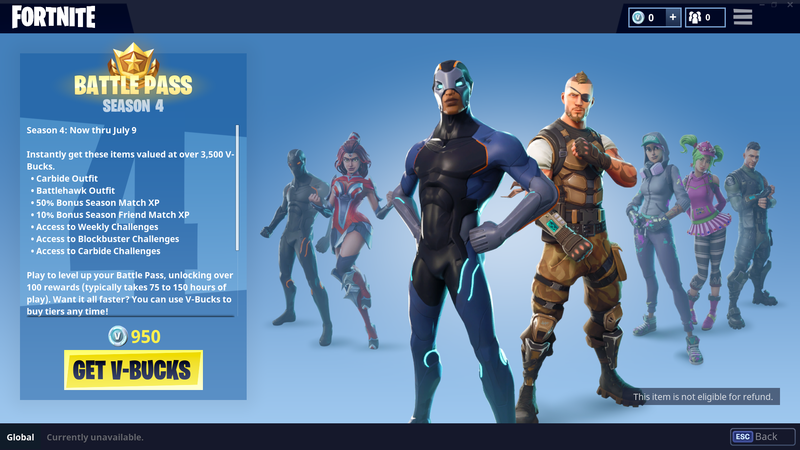 Fortnite also offers Limited Time Modes (LTM) with special gameplay rules, such as Final Fight, which features five teams of 20 players. LTMs change every week or so and certainly help add variety to the overall gameplay experience. Realm Royale features a handful of weapon types (including rifles, pistols, etc. ), and all basic weapons can be equipped by any class. Players can also craft a class-specific, Legendary quality weapon with an elemental affix, granting the weapon an additional effect, such as a fire damage-over-time effect or the ability to slow enemy players. There is no need to collect ammunition, as all weapons have infinite ammo and just need to be reloaded. Weapons are obtained in chests or via crafting (Legendary class-specific weapons only). Fortnite offers a similar number of weapon types (including pistols, shotguns, etc. ), but offers many more unique weapon choices. Weapons are obtained by looting from the ground or collected from chests. Ammo can only be looted from the ground, chests or ammo boxes. Weapons can hold 999 max ammo, except for the rocket launcher (which, not surprisingly, only has one rocket). Realm Royale offers players the ability to ride a mount to traverse its map. Currently, there is only a horse available, but additional mounts have been teased (including a raptor) and will likely become cash-shop cosmetics or event rewards in future updates. While the mounts are a generally a cool, well-liked feature in games, in Realm Royale they feel almost necessary due to the size and general sprawl of the map, which features large areas featuring mostly empty terrain between settlements. Fortnite has shopping carts which can be pushed and rode in, but no other vehicles at this time. Fortnite’s map is generally more dense, so there’s not as much of a need to travel long distances to get to the areas with materials you need. Fortnite offers additional player mobility through use of building structures along with the Launch Pad, which can be built on a player structures at great heights. Using a launch pad will allow you to glide to different areas of the map. In Realm Royale, when a player’s health is reduced to zero, they are transformed into a defenseless chicken and must frantically fight for survival by dodging enemy player shots. If the player manages to survive for 30 seconds, they will respawn with 50 percent health and keep all of their equipped items. If not, they will be eliminated from the game. There’s a chicken counter located in the bottom left of the game UI that shows how many clucks you have remaining. If you’ve already been clucked three times, you’ll be automatically eliminated on next knockdown. In Fortnite, when a player’s health reduced to zero, they are knocked down—down but not out. You can crawl, with a very brief period of invulnerability, as your health will slowly tick down from 100 until you eventually bleed out and are automatically eliminated. Before this can happen, you can either be killed by an enemy player or revived by a teammate. Die and you go into spectator. Get revived and you’re brought back with 30 health and get to keep all of your items. Unlike Realm Royale, there’s no limit to the number of times you can be downed in a map, as long as your squadmates are able to keep reviving you. Realm Royale’s map is a large island that features multiple areas with distinctive themes, including a snow-covered area featuring an icy lake (Everfrost), a dense jungle with ancient ruins and a thick swamp (Tropics), an arid region full of quarries and rocks (Badlands), and more. This offers some visual variety depending on where the player decides to land. The maps are filled with fantasy-themed buildings, including charming towns with wooden buildings, a lumberyard, and even a large, run-down castle. 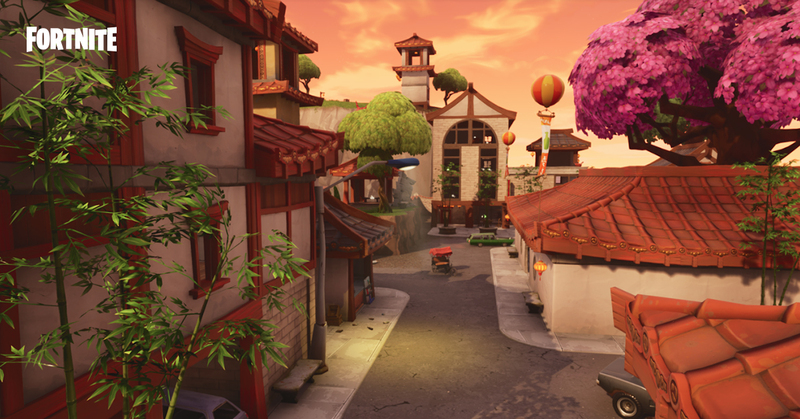 Fortnite’s map is pretty much entirely covered in grass (or concrete) and features a more urban theme, containing locales including convenience stores and a taco joint, and featuring “real world” elements such as shipping containers. The areas are generally much more dense as scenery elements must be destroyed for crafting materials. Both maps are similarly sized, but Fortnite’s seems much “busier” which can offer for more strategic and challenging fights. Epic Games occasionally adds new points of interest to the Fortnite map, reworking specific areas. 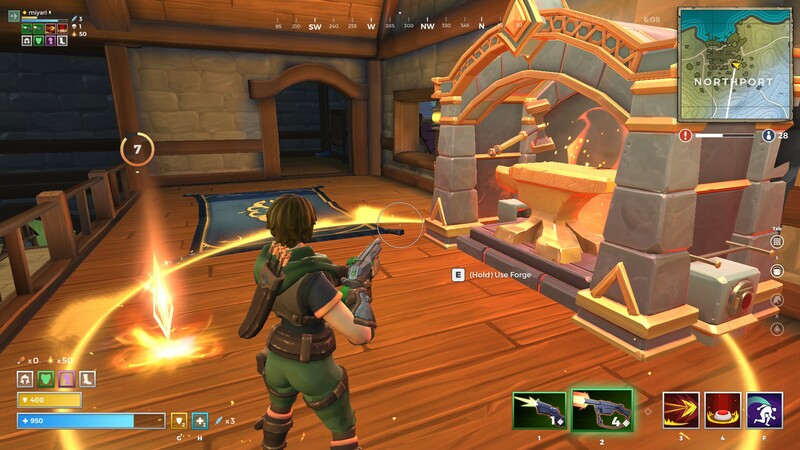 Realm Royale features a crafting system that uses Shards, obtained by disenchanting items and abilities. Collect enough Shards and travel to a nearby Forge (marked with a yellow anvil on the minimap), and you’ll be able to craft Legendary-quality items including armor, abilities and weapons. You’re also able to craft Health and Armor potions. There is no crafting outside of the Forge. In addition to Shards, Legendary class-specific weapons also require two Chicken Trophies, obtained by killing enemy players. Fortnite does not feature the robust weapon crafting system of its non-battle royale game mode. Instead, it features what is considered more of a building system, in which players can construct ramps, platforms and structures to help gain strategic advantages over their enemies. To do so, you must collect a variety of different materials including wood, stone, metal, by destroying the map or by picking it up off the ground. Realm Royale features five different weapon rarities that apply to weapons, armor and abilities. Armor adds to a secondary shielding stat that must be consumed before the player’s health bar is affected. Players search the map for three different types of chests that contain weapons, armor and consumables. The only time you will encounter ground loot is if it has been dropped by a player or upon looting a chest. Occasionally, Gold Chests will spawn on the map that contain a Legendary quality weapon. When a Gold Chest is available, an icon will display on the minimap and orange beams will be visible shooting to the sky above the chest. 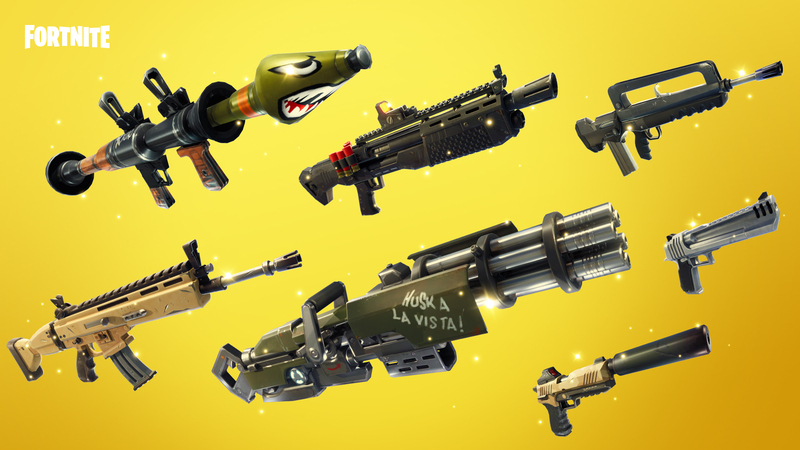 Fortnite also features five different weapon rarities, but there are no lootable armor or abilities. Instead, armor is increased through use of consumables. Fortnite features ground loot, meaning items are visible and can be looted from the ground, and also features treasure chests and safes, which glow and make noise when you’re near one. Occasionally, Supply Drops will drop randomly from the sky, which can contain high rarity weapons. Players can also loot Supply Llamas, which are limited to only three per match, and contain tons of ammo and materials and a few consumables. Realm Royale has just Armor and Health Potions, though some classes have regenerative abilities like the Warrior’s Flask of Healing and the Engineer’s Healing Totem (learn more about these in our Realm Royale abilities guides). Additionally, all potions must be channeled to use, which means you’ll want to get to cover before attempting to heal up. Currently, there are no other consumable items in the game. You’re able to carry as many Armor and Health potions as you want, and can craft more at the Forge. Fortnite, on the other hand, has many consumables that can restoring varying levels of health (including Apples, Med Kit, Slurp Juice, etc.). Most of these offer instant health recovery, though some larger restoration items require a channel (the Chug Jug, for example, takes a full fifteen seconds to consume). Fortnite also features utility items such as grenades and traps. It’s worth noting that some Realm Royale class abilities offer similar functionalities. Consumables in Fortnite have individual item type caps, and inventory space is limited, so the game offers additional complexity through inventory management. Realm Royale features a rudimentary ranking system that awards a player rank based on your performance in your 50 best games. If all fifty of your best games are wins, you’ll have automatically reached the Master rank. This means that, eventually, anyone can earn Master rank so long as they manage to reach 50 wins. Beyond that, you are numerically ranked based on the number of eliminations you have accumulated. You can learn more about this system in our guide. The game features individual rankings for Solo, Duo and Squad play. Fortnite features an in-game wins leaderboard for Solo, Duo and Squad gameplay that can show global or friends-only rankings. At this time, there are no ranking tiers or brackets, but it’s always possible that such a feature is added in the future. Realm Royale is still in early Early Access, so there’s still many features that have yet to be added, including Fortnite’s incredibly popular Battle Pass, which is being adopted by many other battle royale games. Battle Passes are certainly coming to Realm Royale, which comes as no surprise as they’re already available in Hi-Rez’s other popular titles, Paladins and Smite. Realm Royale also currently lacks Fortnite’s expansive market of cosmetic items, but as with any online multiplayer game, we’re sure it’s only a matter of time before they are added. Fortnite’s Battle Passes are purchased with real money and offer unique, season-specific challenges, unlockable items, and just generally add a whole lot more gameplay (and fun) to the game. Fortnite also features an in-game market of diverse cosmetic items that can be purchased for V-Bucks, obtainable by spending real money (or occasionally as challenge rewards).